One of the most critical part of the ship design is the design of the Ship’s Electrical Power Generation and Distribution System. The introduction of many new products and the advancement of technology in this field have made the design of Ship’s Electrical Power System very complex and challenging. As in the case of any aspect of ship design, the design of Ship’s Electrical Power System is also determined by the design rules defined by the classification societies. The rules of the Classification Societies for design, construction, installation or inspection of electrical equipment for ships are predominantly based on internationally accepted standards such as IEC 60092 and IEEE SA 45 and the implementation of these rules includes a number of processes during all stages of ship construction. 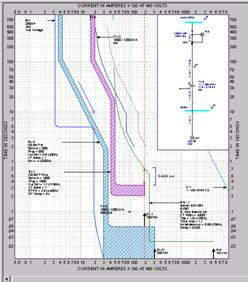 Overall Single Line Diagram: The overall Single Line Diagram (SLD) is required to be approved by the Classification Society. It is a diagrammatic representation of the Ship’s Power System depicting the Generators, Transformers, Main and Auxiliary Switch Boards, Converters, MCCs Battery Systems and major consumers. All the important system specifications are to be mentioned in the overall SLD. Switchboard Single Line Diagrams: In addition to the overall SLD it is also required to produce the SLDs for each switchboard for AC, DC and UPS power distribution. These drawings should have the details and ratings of the feeders including the interconnectors, cable dimensions and the settings of respective protective devices. Electrical Consumption Balance: The purpose of this document is to study the consumption of the available power during various modes of operation of the ship such as Normal operation, Maneuvering, Combat operations, DP operations, Heavy Duty Crane operations, Cargo Handling, Normal Harbor operations etc. This document is normally produced in a tabular form stating the calculated design values of power consumption of each consumer under various modes of operation. The tripping of non-important consumers shall be determined based on this information and the Power Management System can be programmed accordingly. Power System Philosophy: This document is submitted for the information of Classification Society and it explains the basic philosophy of the Ship’s Power System under various modes of operation. It will also have the details of the functionality of system/sub-system/consumer for automatic operation of the circuit breakers, Power Management System, Dead Ship Recovery, Emergency Power arrangements, Black-Out Recovery, etc. Short Circuit Calculation: The Short Circuit Study or Fault Study is carried out to correctly size the buses, protective equipment and the cables. Preliminary short circuit calculation can be carried out once the load analysis and the number and ratings of the generators are determined. The calculation of Short Circuit Current is based on IEC 61363 and IEC 60909 and the study is conducted by calculating the symmetrical (RMS) and asymmetrical fault (Peak) currents using various methods such as MVA Method or Per Unit Method. 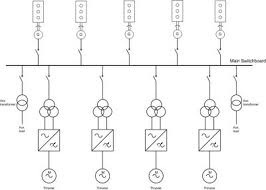 Harmonics Distortion Calculation: A Harmonics study is to be conducted if more than 20% of the connected load are constituted by semi-conductor assemblies such as Variable Speed Drives/ Static Frequency Converters. These semi-conductor assemblies produces harmonic currents which distort the ship’s power supply and causes damage to the electrical equipment. The Classification Society therefore insists the Total Harmonic Distortion of the voltage waveform for the overall power system shall not exceed 5% and it is required to submit the calculations/study document to the Classification Society with the details of the same. Voltage Drop Calculations: As per the classification society rules the voltage drop at the terminals of the generator when a sudden load, such as a motor, is switched on, should not be more than 15%. A voltage drop more than the acceptable limit may cause malfunctioning of other electrical/electronic equipments in the system and may even activate the tripping of under voltage protection devices. A study is required be carried out to calculate the effect of starting of the largest motor load on the power system voltage and the documentation of the same is to be submitted to the Classification Society for their approval. Discrimination Analysis: The Discrimination Analysis also known as Protection Coordination Study is to be carried out to determine the settings for the protective devices (circuit-breakers and relays) which would reduce damage to equipment and to isolate only the circuit that has a short circuit or fault thereby causing minimum disturbance to the rest of the power system. These studies also verify the correct fuse size and determine the protection required for conductors, transformers, and other equipment. The protection settings of each equipment is to be set primarily based on its individual characteristics and thereafter necessary coordination setting is to be done with respect to the reminder of the power system. 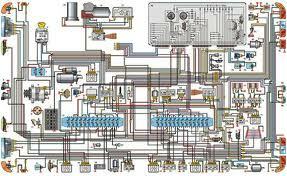 In addition to the above, other design documentations such as Failure Mode Effect Analysis (FMEA), Test Procedures (HATS & SATS), Electrical Schematic Drawings, Cable Selection Philosophy etc. are also required to be prepared and submitted to the Classification Society as a part of the design approval process for a Ship’s Electrical Power System. It should be noted that the Ship Design is an iterative process, especially the Ship’s Electrical Power System design and therefore several revisions of the design documents may be required to be produced for the design approval. The preparation of these documents normally involve power system studies which can be easily carried out by using application softwares such as ETAP, EDSA, Captor/ Dapper etc. It is always advisable to have strict version and quality control measures in place to ensure the accuracy of the data and documentation produced for the design and analysis of Ship’s Systems in general and the Power Systems in particular. This entry was posted in All, Technical by arshadtk. Bookmark the permalink.